Functional digestion is the basis of general well-being. Oat fibres promote abdominal activity, prevent constipation and support intestinal well-being. Fibrous food increases the feeling of fullness and, therefore, also facilitates weight management. Fibres are nutrition for intestinal microbes. The more diverse the beneficial bacterial strain of the bowels, the better it is from the health point of view. Intestinal microbes should be fed with fibre-rich food. The fibre is accompanied by a whole host of co-passengers, which explains some of the health effects of fibre-rich food. These useful co-passengers include vitamins, minerals and phenolic compounds. A high-fibre diet provides protection against type 2 diabetes, cardiovascular and vascular diseases, as well as bowel cancer. The best sources of fibre are grain products, vegetables, berries and fruits, nuts and seeds. 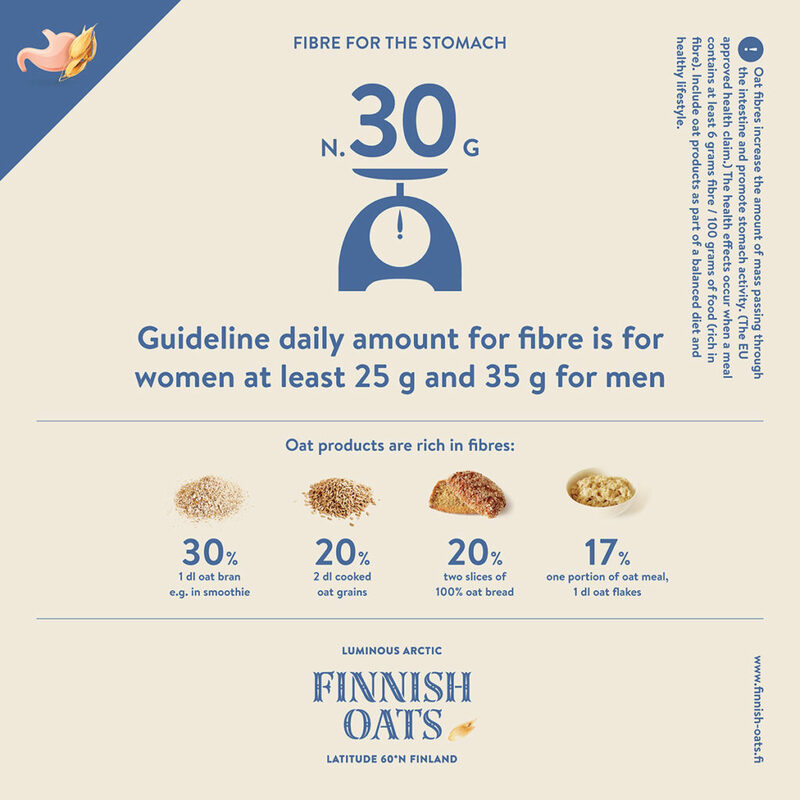 At least 25-35 grams of fibre should be consumed a day. Oat products help to achieve this goal. Oat fibres increase the amount of mass passing through the intestine and promotes stomach activity. The health effects occur when a meal contains at least 6 grams / 100 grams of food. It is estimated that up to one in every five Finns has a delicate stomach which is caused by what is known as irritable bowel syndrome. It is a functional abdominal disorder that is 2-3 times more common in women than in men. Common symptoms include swelling, pain and flatulence, which may be aggravated by foods that are unsuitable for sensitive stomachs. Celiac disease requires a life-long gluten-free diet, but in other stomach complaints, gluten is rarely the cause of the symptoms. More commonly, symptoms are explained by FODMAP carbohydrates, which are abundant, especially, in plant products. The symptoms are due to intestinal microbes fermenting or using these poorly absorbed carbohydrates in the large intestine. Limiting the number of FODMAP-carbohydrates in a diet often eases symptoms of irritable bowel and delicate stomachs. Grains of rye, wheat and barley contain a large amount of FODMAP carbohydrates, while oats are also suitable for those with delicate stomachs. Oats are suitable for a gluten-free diet, as they are naturally gluten-free. Pure gluten-free oats are suitable for those with celiac disease. That is a life-long illness that can affect anyone at any age. It is treated with a gluten-free diet. Anyone with celiac disease must avoid rye, wheat and barley in their diet, as the gluten in these foods causes inflammation and damage to the small intestine of the person. A precise dietary treatment remedies and prevents intestinal damage. There is more fibre in oats than in many other gluten-free grains. It is, therefore, a nutritionally recommended and healthy addition to a gluten-free diet. However, not just any oat product can be used, since the oats may be contaminated with other gluten-bearing grains during the cultivation and manufacturing process. Gluten-free oats are a safe choice for those suffering from celiac disease. Their purity has been assured during all stages of its cultivation and manufacturing from the field to the packing. Gluten-free oat products have a gluten content of less than 20 mg / kg. The products’ suitability for a gluten-free diet can be ensured by checking the labelling of the products. Read more about celiac disease and a gluten-free diet on the Finnish Coeliac Society’s website (English).